Club Penguin Cheats by Mimo777 Club Penguin Cheats by Mimo777: Elite Penguin Force is "Radio Silent!" Elite Penguin Force is "Radio Silent!" I guess we need to be resourceful to know what to do next, don't ya think? Cool, just a question how can i be mod :) please reply . Does that mean that no more Spy phone messages, never again?? Club Penguin Secret Agent Reviewed By You! Club Penguin App Coming Soon! Club Penguin's Mt. Ruapehu Ski Slopes! The Great Snow Race Is On by Billybob! Club Penguin Racing Newspaper and Secret Message! The Club Penguin Great Snow Race is Here! Club Penguin Pin Cheat - POLAR PAW PRINT PIN! Club Penguin Beta Team Chat Improvements! Club Penguin System Defender Level By Billybob! Club Penguin Updates Top of Screen! 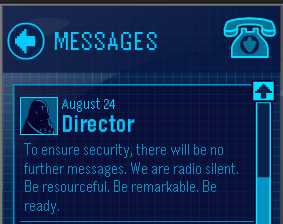 Director "Highly Dangerous Mission" Message! Club Penguin Message from Director... Again! Club Penguin Message from Director! Mimo Club Penguin Snowboard Contest Finalists! Club Penguin German Blog Update! Club Penguin Top Secret EPF Video! Great Snow Race Sneak Peek! Mimo's Wicked Snowboard Contest... Ending Soon! Club Penguin August Parent Update! Club Penguin August Membership Page! Team Blue vs. Team Red at the Stage! Club Penguin Team Postcards Have Arrived! Herbert WILL Attack the Lighthouse! Elite Penguin Force Tuba Playing Video! Island Party Reviewed By You...Finally! Beta Team Games Now Working! Welcome to Club Penguin Commercial! Jet Pack Guy Send Message! Club Penguin Igloo Furniture Released! New Club Penguin System Defender Level? Club Penguin New Zealand Snowboard Competition! Club Penguin Pin Cheat - CHECKERED FLAG PIN! Club Penguin Times Issue 303! Club Penguin Furniture Sneak Peek! Club Penguin Hosts Hospice Children! Gary has "Nothing To Report!" Rookie Sends Gary A Message! Club Penguin Updates The Beacon! Club Penguin Times Reveals New Party - SNOW RACE! Club Penguin Catalog Sneak Peek! Rockhopper Island Map & Other Secrets! Club Penguin: Behind the Scenes!